When we heard of the innovative concept “OFF” door handles last week we thought they would make an interesting read so decided to introduce them to you and our other visitors. An ultra-modern front door handle, the concept “OFF” door handles designed by Eun Ah Kim, Jinhyuk Rho & Maria Rho take handle technology to the next level, so much so that the hi-tech door handles won the Red Dot design concept award. Along with a normal handle function, “OFF” door handles are connected to your main utilities enabling you to turn off the lights, electric and gas within your property after leaving the house. Similar in design to that of the indicator stick light control dial in cars, “OFF” door handles have a small power button and dial at the far end of the handle which enables selection of settings that best suits the user. 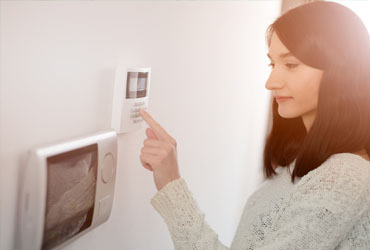 Upon leaving your home all you would need to do is tap the power button and all appliances and mains utilities connected would be turned off, on arriving back a 45 degree turn of the handle and not only are you through the door but everything connected turns back on at once. The benefits “OFF” handles would bring if ever put into production are quite considerable whilst supposedly environmentally friendly, reducing electricity and gas consumption, saving you money while countering the effects of global warming. User advantages of installing these hi-tech door handles would include a reduction in time spent turning off appliances, providing a central control unit for your utilities, and also helping in the prevention of fires. Unfortunately however the downsides we see to concept “OFF” handles are plentiful. It doesn’t seem the designers have considered your fridge/freezer and the food within defrosting nor that most gas boilers are still without auto-ignitions and would require re-lighting. Another point someone in the office made was that providing such controls on your front door would leave you wide open to pranksters turning off your utilities or even burglars. Although we see the advantages these handles could bring to a busy house one day the downsides clearly outweigh them. Our conclusion for the award winning “OFF” handles is that further development is needed before it can go from concept to production.